Can Robo-Advisors Deal With Retirement Planning? Retirement planning and asset allocation aimed at retirement income are two services Robo-advisors often offer. How do investors feel about the capability of Robo-advisors to address their needs related to retirement? Spectrem’s new in-depth examination of investor attitudes towards Robo-advisors offers answers to those questions. Robo-Advisor 3.0 asked investors who have accounts with Robo-advisors whether they feel their electronic advisor can provide the same quality of service a human advisor can, or if in fact their Robo-advisor can actually do particular tasks better than human advisor. 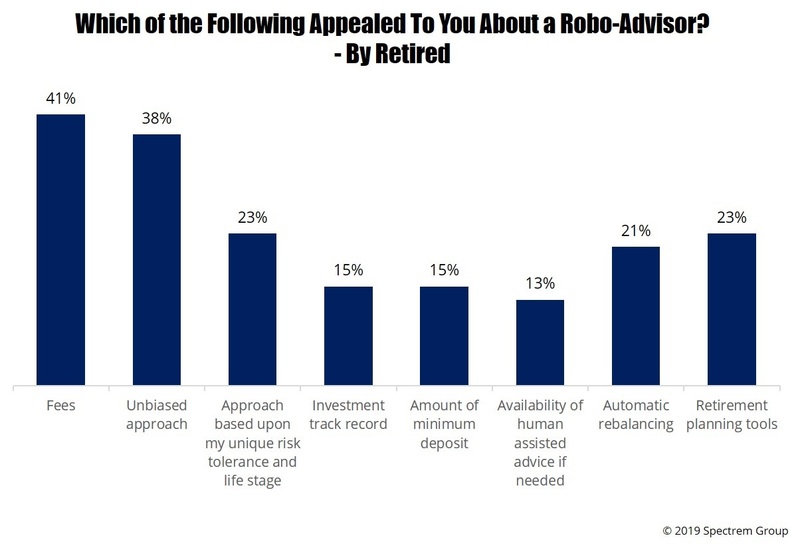 According to Robo-Advisor 3.0, 27 percent of wealthy investors who use a Robo-advisor said retirement planning tools were an appealing service provided by Robo-advisors. Robo-advisors can examine an investor’s current income and future retirement income, including potential Social Security benefits, to offer advice regarding that investor’s financial preparation for retirement. The question is whether the retirement planning services provided by a Robo-advisor are equal to the same services a human advisor can provide. Do investors believe a Robo-advisor takes into account all of the variables that can be presented and discussed with a human advisor? Robo-Advisor 3.0 provides an answer to that question. Investors who have a Robo-advisor were asked who would do a better job selecting investments for a retirement plan such as a 401(k), and the answer to that question is very revealing. Thirty-four percent of all investors believe a Robo-advisor would do a better job than a human advisor, and 23 percent believe there is no difference between the two types of services. That’s a majority of investors who believe Robo-advisors are at the very least equally capable of selecting investments for a retirement plan. And how would Robo-advisors do when an investor is ready to retire? Can a Robo-advisor adjust investments in order to provide proper administration of investable assets when an investor approaches retirement? Among all investors, 39 percent said a Robo-advisor could adjust investments in order to provide proper administration of investable assets for retirement better than a human advisor could. Nineteen percent said there would be no difference between the performance of a human or a Robo-advisor toward adjusting investments for retirement. That’s almost 60 percent who believe a Robo-advisor is a capable service for handling retirement investment decisions.